I was the oldest of a large family, and I aspired to be a good girl. Not so much in the sense of morally superior; I wanted to do it right, correctly. Even as a child, I was a perfectionist. If there is something to be assembled, I am reading the instructions. If we are going somewhere, the map is in my hands, opened, and I know which exit we just passed, and how many more until we arrive. And when it comes to the care and feeding of a middle-aged woman, I have read the manual, and I’ve been trying to follow the directions. To make sure the exercising got done, I always did it first thing in the morning. But a funny thing happened on the way to better health. My garden got more and more neglected. “No, duh, Kathy,” I hear you saying, “you just didn’t have enough time.” Well, none of us has enough time, do we? But that wasn’t quite it. I was dutifully giving my best time, my most effective hours, to a boring exercise regimen, and when there was time to garden later in the day, it was too hot, or I was too tired, or I was just plain engrossed in something else (usually writing or computer related) and forgot to make time. This summer, I just said no to the good-girl, follow-the-rules exercise routine, and gave my best morning hours to gardening. Each morning I venture forth shortly after my husband leaves for work, and usually keep at it until the heat, humidity, or bugs drive me in, sometime in the late morning. I started out in late May and early June pulling garlic mustard. Then it was on to my own flower beds, bringing the best-kept ones up to snuff and then tackling the more neglected ones. I can’t tell you how enormously satisfying this has been, but if you’re a gardener, I suspect you know. Weeds don’t just steal nutrients and water from the cultivated plants. They spoil the design, obscuring the carefully (or not so carefully) planned color schemes, the contrasts in texture. It’s like someone colored outside the lines in your coloring book, and by weeding you remove those errants marks. I’ve been especially happy working on the Juneberry bed that has discouraged me–no, shamed me for so long. Talk about not doing it right! I never got it finished last year, in part because I was trying to reclaim it the “right” way, working on one section at a time, getting all the weed roots out, replenishing the soil, cutting a new edge, and deadheading. This time around I just tackle whatever bugs me most at the moment, and the goal is not to do it right, but to make it look as good as possible as quickly as possible. How superficial. How inefficient. How self-indulgent! Yes, I’m not following the rules, and gardening is a lot more fun! This is a view from the opposite side. The rule-following good girl is just sure something bad will come of all this rule-breaking. The grass roots I didn’t pull out will resprout and make further inroads. There will almost certainly be a muscle spasm before the year is out, as the lack of stretching takes its toll. I’m not losing any more weight, but I haven’t been gaining, either, and I just hope the lack of aerobic exercise doesn’t make me more vulnerable to the medical problems I’m at risk for. Living dangerously, Kathy Purdy style. That’s my summer in a garden. 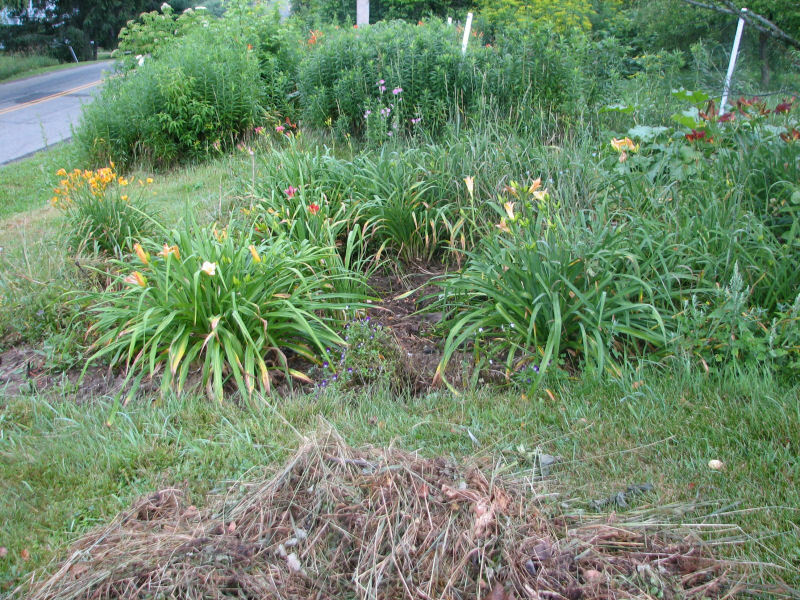 A little shift in routine, a lot more weeds pulled–even if I didn’t get all the roots. Oh, well, nobody’s perfect. This is my contribution to the June-July Garden Bloggers’ Book Club meeting. For some reason the library sat on my request for My Summer in a Garden and are just getting around to processing it. So instead of reviewing the book, I’m describing my own summer instead. Another late comer to the garden party but there are plenty of the youngest and scads of sloppiness around us so what you describe is great to aspire towards. I know I’m late to the party, but I loved your description of a perfectionist so much that I emailed it to my younger sister (why do the oldest girls end up being perfectionists?). I’m fat, but I figure if I break a sweat every day I’m exercising! I’m also the oldest and a perfectionist. In the summer I garden first thing–from 7 to 9 or 10. I used to check the computer first but if I do that I end up wasting the best part of the day indoors. Funny how our lives run in parallel. Annie, what makes a farm a farm? The amount of land? The use to which you put it? Whether or not you make money from it? Yes, there’s a lot of land to “boss,” but it’s not all under cultivation. you only live once! i’m glad to hear you’re allowing yourself this pleasure. 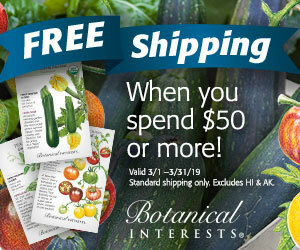 maybe you can make up for it eating more homegrown veggies? Good luck with feeling stronger while bending, if not breaking your rules… but Kathy, with all that land to boss, it looks more like you’re farming than gardening to me! Robin, I remember reading that post and agreeing with it. I am maintaining my weight, but who knows if I still have the same muscle-fat ratio? I am not getting stronger, but hopefully not too much weaker. And there is something more satisfying about doing purposeful activity to stay healthy, versus make-work exercise. Cynthia, I hear you! The one thing I am careful to do is vary my activity and position. After 15 minutes of weeding, I switch to deadheading or moving wood chips. And if shoveling woodchips into a wheel barrow, shoveling them in between daylilies, and pushing a wheel barrow full of weeds to the compost pile are considered weight-bearing activities, then, yes, I’m still doing that. Pam, a lot of it is attitude. I certainly got out in the garden last year, but gave myself permission to make it a higher priority this year. I really think it is the permission that enables me to have more fun. But I have to admit that I envy your tossing out the book on the whole exercise rule. I wish I had the time for everything. Your day lilies are so pretty. I planted one last year and actually thought it wouldn`t come back this year, but it`s starting to bloom. You`ve reminded me that I need to do some weeding myself. So darn hot here all of a sudden though. Just be careful as you “live dangerously.” Okay? Do some intentional stretching as you’re pulling those nasty weeds! Maybe try to work some of the weight bearing excercise into your gardening too! It might take some thought, but I bet it could be possible. I want you to be healthy AND good – esp. come September when you have BIG committments!! 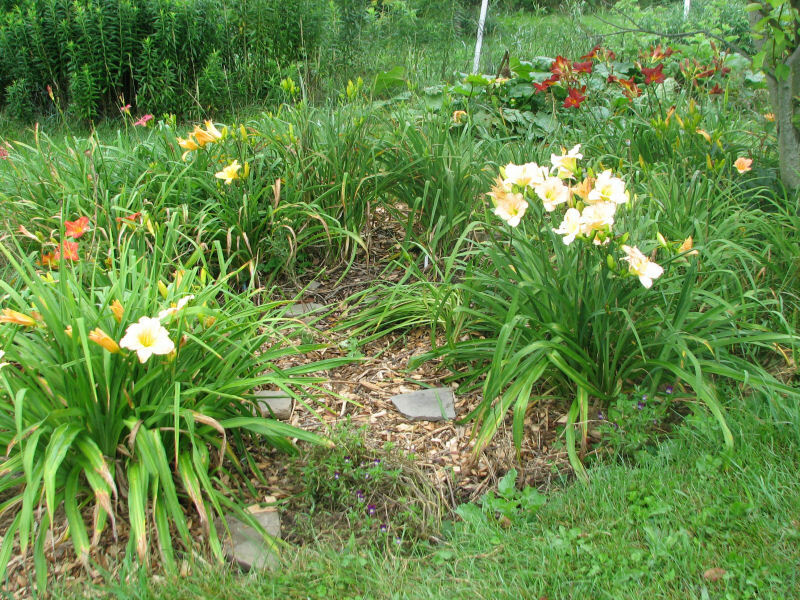 It’s good that you’re having fun out in the garden again, and your daylily bed is looking so pretty. Gardening can be good exercise too. Zoey, I know what you mean. I have had to reinstate an exercise routine before. It is hard, and it is necessary! No, Gail, no one enjoys life when we break all the rules. It’s knowing which rules to break . . . which ones were self-imposed non-rules. It’s all about finding balance, isn’t it, Carol? Sometimes aspiring to perfection is the way to go, other times “good enough” is all that’s needed. And wisdom is being able to tell the difference. I exercised regularly for 2 years until I started gardening back in May. I’m still trying to find balance with gardening – I’m completely obsessed right now. Your post was very thoughtful. I enjoyed it. 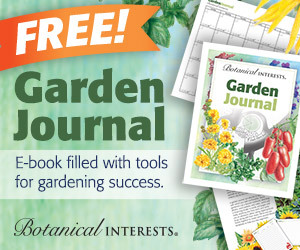 Kathy… thanks for posting for the Garden Bloggers’ Book Club. I think a good motto would be “Garden first, the rest will take care of itself”. My other motto at work to keep the perfectionist from never feeling anything is finished is “don’t let perfect get in the way of good”. Good job breaking your own rules this summer in your garden! Kathy, the gardens look great, gardening is good exercise, so perhaps a every other day thing would work good. Glad to see your being a “rule breaker”, I think you’ll enjoy all of life more. LOL. The gardens are looking good, Kathy. Hopefully you are getting enough aerobic exercise with the extra outside work. Just be careful because I speak from experience when I say it’s hard to get back to the early am exercise routine once you quit. I went to the gym at 5:30 AM, 5 days a week for three years. Then I started missing a day or two, and then a week, ….you get the idea. Now I don’t go at all…EVER….and have gained a TON of weight. Exercise is really important–one of these days I need to get back to practicing what I preach!